I just updated to Kodi Leia and wanted to try out the music library after not using it for a while. All my music is perfectly tagged by picard with musicbrainz IDs for artists, albumartists etc. This works for all artists and albums except for abums by multiple artists. This results in one library entry for 'Prince' and one for 'The Revolution' which is fine for me. But the albumartist 'The Revolution' doesn't show up with artwork or any information from the local nfo file. Shouldn't both be the same here? Another example: The album 'Watch the Throne' by 'Jay-Z & 'Kanye West' while I also have one folder for 'Jay-Z' and one for 'Kanye West' with their specific albums. This results in a library entry for 'Jay-Z' and another one for 'Kanye West'. Which is correct. But both are missing the nfo information and 'Kanye West' also misses all artwork. Oh wow I didn't notice that change. Thanks for the hint. So if I understand correctly, I can use the same folder for the Artist Information Folder as my main source folder for music. When I never use the export feature there will never be any file changes from Kodi in my main folder but the problem should be solved? (2019-02-05, 22:44)Maaarv Wrote: So if I understand correctly, I can use the same folder for the Artist Information Folder as my main source folder for music. Yes, you can, but I wouldn't. Here is why... I have 300 albums (yep not a lot compared to many here). I then ran the Export function to create the Artist Information Folder and all the Artist sub-folders. From 300 Albums, I had over 1,000 Artist folders created. Do you really want that mixed in with your Music folder. It will be a nightmare trying to maintain your albums and songs outside of Kodi. I will never use the export feature as I don't want Kodi to add or overwrite files in my music main source folder. But anyways I tried using the new 'Artist Information Folder' and my problem is still the same. Wrong behavior for the examples I already described in my opening post. Another thing I just remembered: Wasn't it planned for Leia to show all albums where a specific albumartist is present? For example also show albums by other albumartists where the selected artist has a feature track or is present on a compilation album? I know this was possible in the past for the time. (2019-02-06, 09:49)Maaarv Wrote: I will never use the export feature as I don't want Kodi to add or overwrite files in my music main source folder. You need to do that to create the Artist folders. The Artist folders need to be named exactly as recorded in the DB. So if Kodi has scraped Olivia Newton-John then you can't name the folder Olivia Newton John, Newton John, Olivia, Olivia John etc. Even the difference in character codes such as ' or ’ is enough for the scanner to ignore it. If you are still having problems with artist artwork, then that is what has gone wrong. Your concern has already been covered and the wiki page explains how to avoid exporting over existing files. Before v18 Kodi could not cope with picking up local artist art and NFO files when the artist was the album artist on collaboration albums (those with more than one album artist) like your example 'Purple Rain' by 'Prince' and 'the Revolution' (each an artist in their own right). In fact because such albums make it impossible to put all music by an artist and only that artist all under a unique folder, it often casued wrong artist art to be associated with the wrong artist. 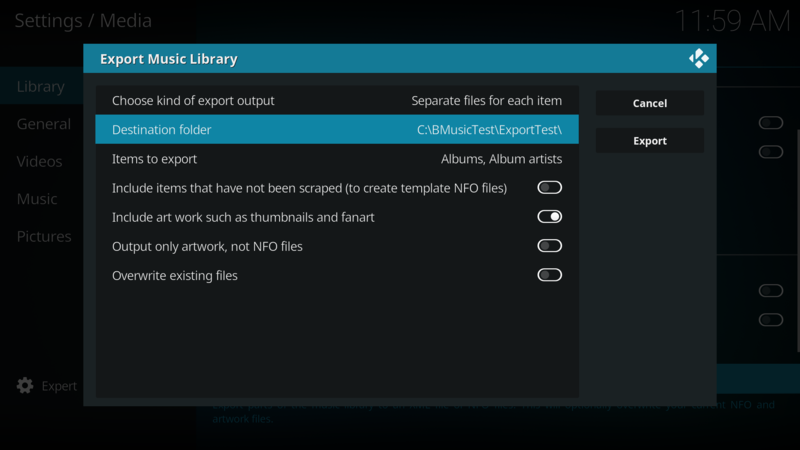 In v18 onwards Kodi has an Artist Information folder - a folder either separate from or can be the same as your music folder (although there are disadvantages to doing that). Within that you can create individual folders for each artist and Kodi will look there fist for art and NFO files. The artist name and folder name must match exactly (including partial mbid if you have more than one artist with the same name). You can use the export facility to create these artist folders for you as an easy way to get the name right, simply direct the export to a separate folder location to see what it produces if you have any concerns. For backwards comnpatibilty where music files have been arranged in a unqiue folder per artist Kodi will also look there, but that only applies to album artists that are not involved with collaborations. Quote: But anyways I tried using the new 'Artist Information Folder' and my problem is still the same. One the music is scanned into the library it does not look again, and so I can't tell if that is why it didn't find the art or if you have simply mis-matched the foldler and artist name. The simple way to test the latter is by exporting only album artists to a separate test folder which will show what Kodi thinks they should be called. You don't say how you have arranged your collaboration (multiple album artists) albums along side your other music. Do you have any other albums by Prince, The Revolution, Jay-Z or Kanye West? Perhaps none? You seem to expect Kodi to apply the same art and nfo to multiplel collaborators. If say 'Purple Rain' was the only music by Prince or The Revolution that you have then, by accident (not design), v17 would have looked in the folder above the only album and done that. However the same happy accident sometimes produced art chaos for other users. Leia will see that same folder above the album as belonging to more than one artist and therefore does not grab any artist art or nfo from there. But I am guessing what your music is. My advice is to try using export and things should become clearer regarding foldr names. Unfortunately the wiki is not updated for v18, but music export now works quite differently to video. You can safely export selected kinds of item to separate files in a separate location of your choice as a test. Note overwrite only happens by choice! This makes things a lot clearer for me. I indeed just tried scanning again after choosing the Artist Information Folder. That's why it didn't pick up the artwork. I'll play around with it the next days and see what happens. I'm actually looking forward to the changes in v18, as v17 caused me nothing but problems with all the 'Extra' artists in my Music collection. As an example in v17, I have needed to clean out hundreds of Artists folders that were created just to store Artists photos and Fanart. Was never really sure what was causing this (Artwork Downloader, CDArtwork, or just Kodi). I'm sure a lot of my Compilation Albums were causing me these issues as well. I've tried many ways to make this not happen with all my Music (there was an add-on in MusicBrainz Picard to remove Featured Artists), which helped, but didn't really fix the issue. Now with v18, having these show up in a "Artist Information Folder" at least puts them in a single location, instead of scattered throughout all my legitimate Artists Music folders (that contain Music).